Any auto technician and certified mechanic at Road Runner Auto Care will tell you that their interest in their chosen careers has not diminished at all from the time they started. Auto mechanics is something that grows on you, and many vehicle owners feel the same way, which is why many of them enjoy taken a do-it-yourself approach to repair and maintenance. As with anything else in life, DIY auto repair has its pros and cons. The greatest motivation of fixing your own car, contrary to what many believe, is not saving money. The main reason was discussed in the previous paragraph: car repair can be interesting and lots of fun. Unfortunately, many DIY mechanics in Apple Valley and Victorville fail to realize the risks and dangers associated with car repair. Granted, some important aspects of maintenance are simple and safe enough to be performed by just about anyone in Victorville, Apple Valley or elsewhere in the High Desert; for example: adding windshield washing fluid, replacing burned out light bulbs that are easy to reach, or even adding power steering fluid to the reservoir. Once a beginner DIY mechanic starts getting into maintenance procedures such as changing the engine oil, danger begins to lurk. 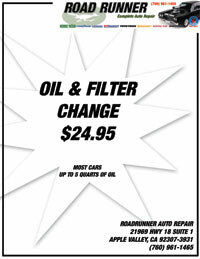 You may think an oil change simply involves jacking up the vehicle, removing the drain plug, draining the used oil, replacing the plug, changing the filter, and filling up the pan. It so happens that each of these steps has an inherent risk. 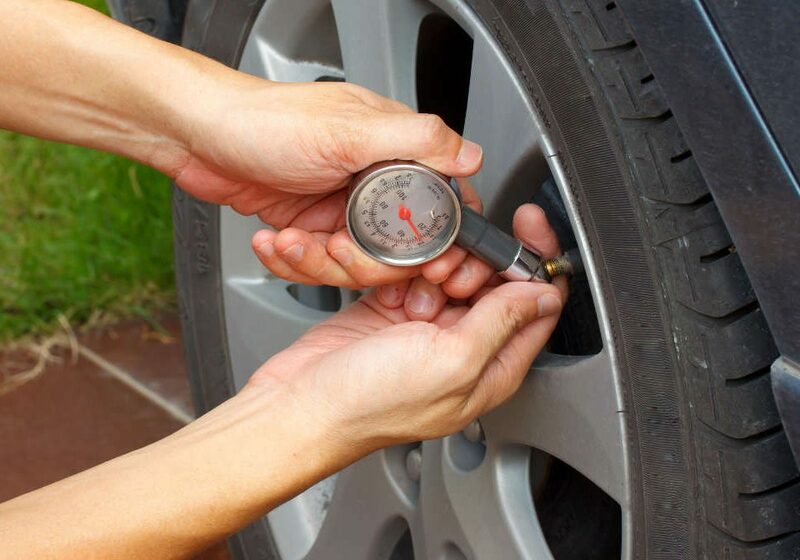 A curbside or driveway oil change is more difficult than at the Road Runner Auto Care shop. If you fail to secure the floor jacks correctly, you may suffer crushing injuries; this is not a concern at the shop. If the drain plug is seized and you resort to strength, your car may slip out of the jacks. If there is a slight leak of oil, fuel, coolant, or hydraulic fluid, you may suffer an eye injury if you are not wearing goggles. Aside from physical danger, there may be other risks such as choosing the incorrect motor oil, which will not kill your car right away but may create serious problems in less than a thousand miles. You may also fail to inspect the spent oil to look for bubbling, grime and discoloration that may signal other problems. In the end, if there is a DIY auto repair issue you are not sure about in Apple Valley or Victorville, contact Road Runner Auto Care.